Please tell me? Has anyone ever actually worn this outside of their house? Love your site! I always wonder though, how come people didn't realize how the clothes looked, well tonight I have my answer. 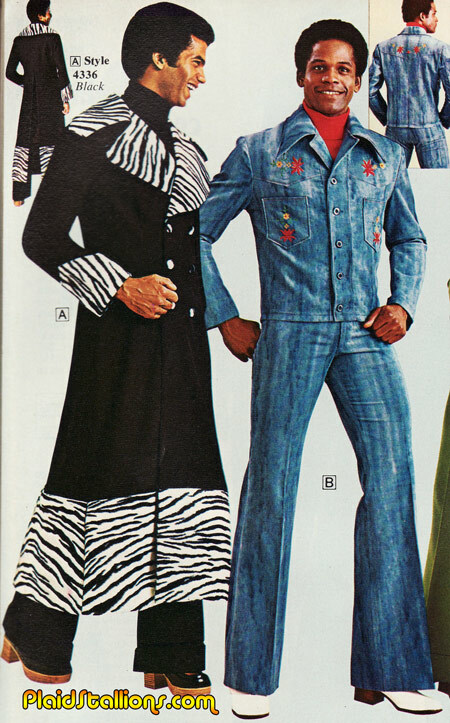 It's 1977, guy picks me up for a date in the fetching denim ensemble on the right, he even had the white shoes. And that looked tacky back then, cheap and silly and I didnt want to go out with him. I did though because he was a relative of a friend, but I never saw him again. He had a CB radio in his car too. So maybe people bought these clothes and wore them, but even then, they didn't look like nice clothes.